The 2019 ‘offseason’ will be different than any other offseason in recent memory, as the Alliance of American Football is scheduled to kick off just days after the culmination of the 2018-19 NFL season. With eight teams making up two conferences for their inaugural season, the AAF is scheduled for 10 regular-season weeks and a postseason tournament in late April. With the kickoff for the new league scheduled for February 9, 2019, we here at Pro Football Focus are expanding our proprietary play-by-play, patent-pending -2 to +2 grading scale to encompass every AAF game from the first preseason snap to the final whistle when the AAF crowns their first-ever champion. PFF’s team of over 500 analysts will cover every player on every snap of every game in the AAF at the very same level of detail we cover the NFL and FBS level of college football. Full game-by-game grades, season-long grades and eventual career grades will be available for all PFF’s ELITE subscribers. Already a subscriber? 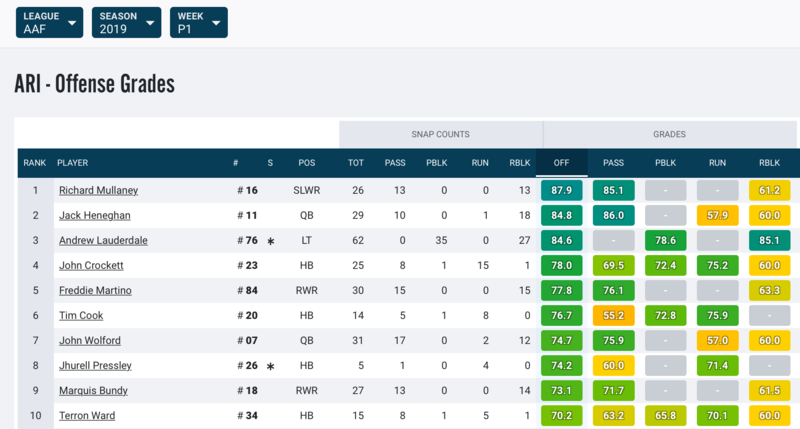 Just simply flip your filter from NFL to AAF in the top left corner of your premium stats homepage. Alongside our play-by-play grading, signature stats and advanced metrics will help showcase player performance, as they’ll accompany our 0-100 grades both at a game level and a season level to accurately depict – in more detail than anywhere else – the fullest extent of play from the AAF’s first season. A byproduct of our PFF grading process, our signature statistics depict every detail of performance on the field including stable metrics like clean-pocket passing and non-play-action passing while others add a deeper look into positions commonly forgotten by the basic box score. From adjusted completion percentage for quarterbacks and yards allowed per snap in coverage in the slot for cornerbacks to allowed pressures by offensive linemen and total pressures by every defensive player and everything in between, PFF’s statistics will tell a story like none other for The Alliance. New to PFF and need a little help understanding our play-by-play grading system? We’ve got you covered. From how we grade quarterbacks, how we grade linemen or how we even grade punters to even our Signature Stat Spotlight series that told a little something about each of our advanced statistics for every position, the fun with our data at PFF doesn’t have to end with the Super Bowl but instead can seemingly be year-round. Not only will our team of analysts be hard at work, but you can also count on our social media team having extended coverage of the AAF as the game unfold, our video team with breakdowns of some of the first season’s top moments and our staff of writers and editors breaking down the league’s biggest stories all throughout the season. Gone is the offseason – bring on more football! 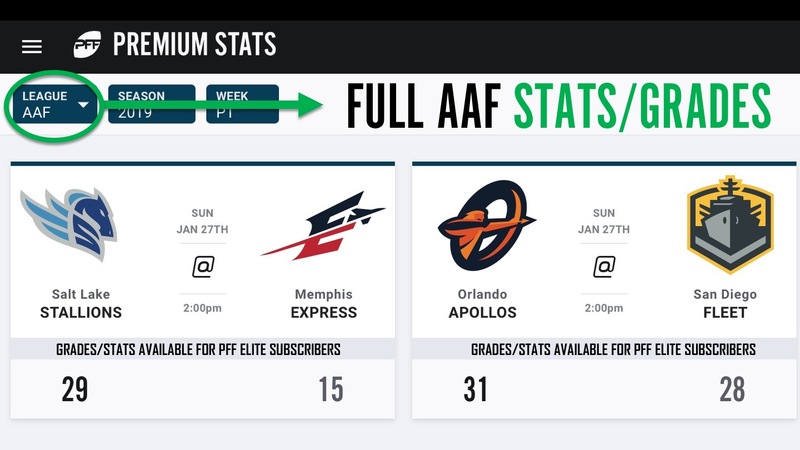 For access to PFF’s grades for the 2019 AAF season, sign up for a PFF’s ELITE subscription and access not only the full extent of AAF statistics but also obtain all the relative information available per subscription from this past year’s NFL season. 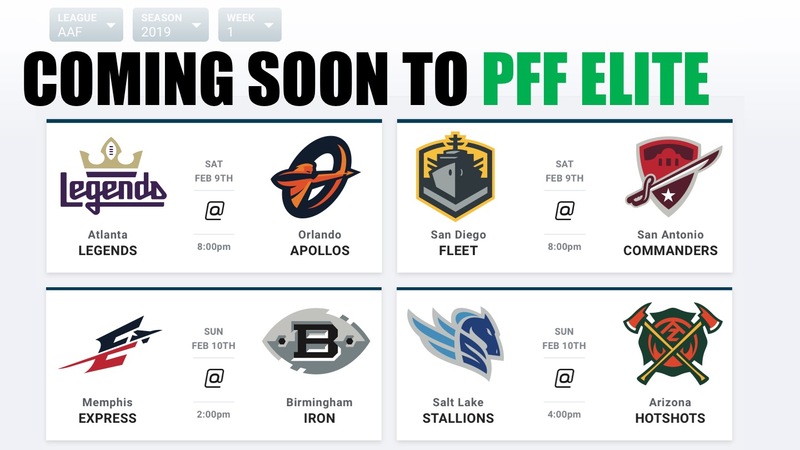 Be sure to pin our AAF homepage to your list of favorites – profootballfocus.com/aaf. And follow along as we document the first Alliance season on Twitter – @PFF_AAF!